For any team, you'll often find repeatable administrative tasks that can be automated — like assigning a specific type of conversation to an in-house expert or tagging certain messages for tracking and analytics purposes. This is what Front rules are for made for. 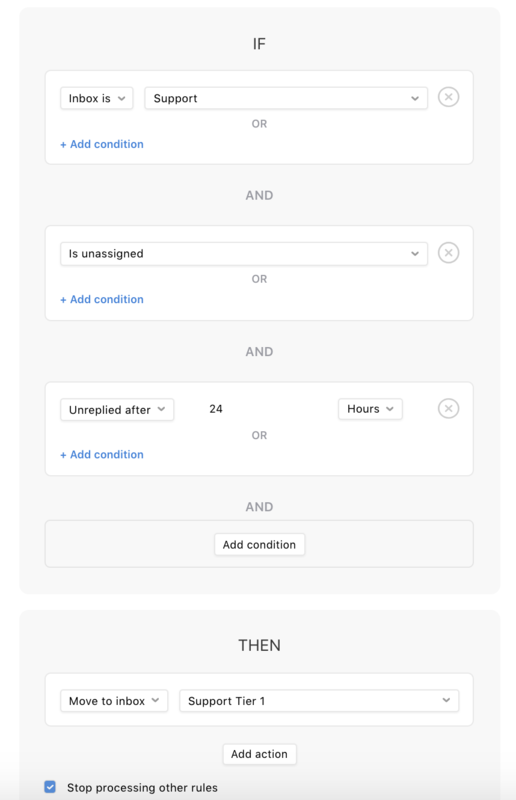 Front rules allow you to automate a wide range of actions, so you can save time in the long run. Head to your Settings and between My rules, to create rules for your individual inbox, or Rules to create rules for a team inbox. 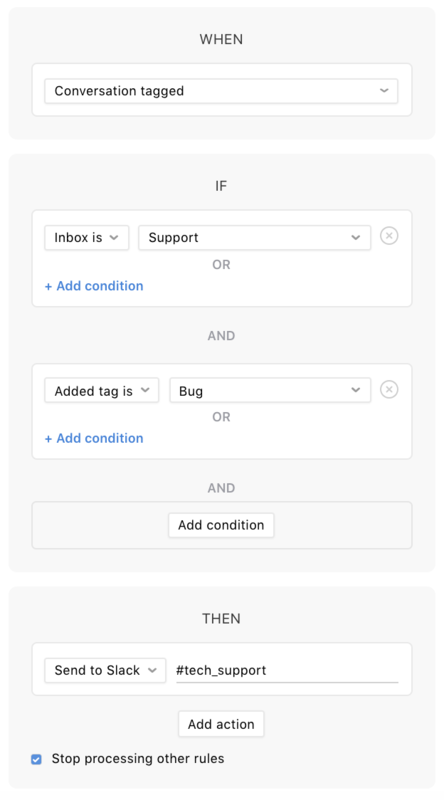 Rules are customizable and flexible so you can apply a set of actions to a specific inbox or a set of inboxes — whatever you need. Need some inspiration? A collection of our most popular rules can be found in our Rules Directory! Use this rule to move messages to another folder or inbox based on a subject line, SLA commitments, or even a group the sender belongs to. Send an immediate reply to your customer so they know you’re getting back to them soon. Notify a Slack channel or a teammate whenever your conditions are met. For whatever reason, my auto-reply isn't working. I have my conditions and triggers set up properly, because my action step is "add tag" and then "reply with". The tag is being added to the message, but the designated reply isn't being sent. Am I missing something? Hai Front Team, we implement some rules for our SLA. In short, we move all unreplied emails to a new folder "Please Reply". However, it seems that when emails are triggered by this rule, all emails will be automatically unassigned (even though we've assigned to someone before). Can we fix it? Hi Alfonsus Wibowo , apologies for not seeing your comment sooner! The default behavior for when conversations get moved is to unassign. 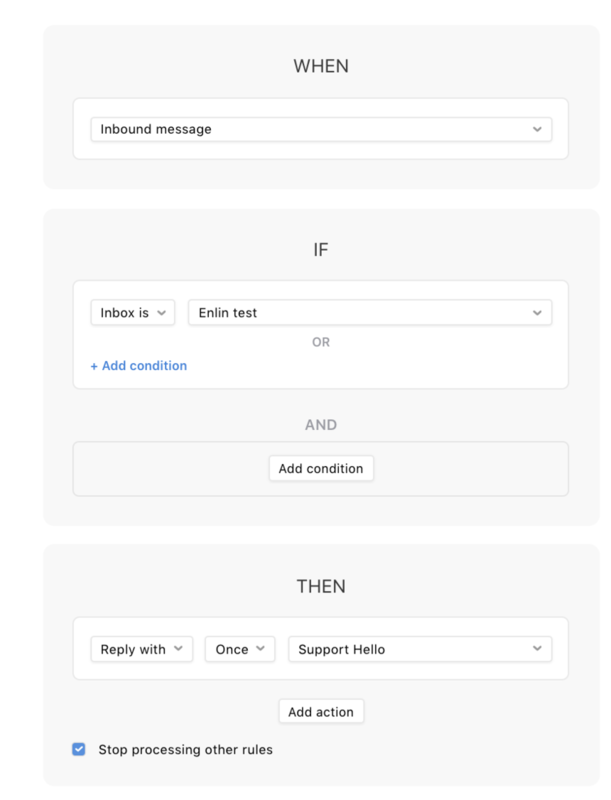 We can help you come up with alternative workflows and rule ideas once we understand more about your specific use case, so feel free to email us at support@frontapp.com!